Summary: Harriet is a Galapagos tortoise who enjoys taking life at her own leisurely pace. Other animals tell her she’s too slow, but she is untroubled. One day she decides to travel to a nearby island to see a penguin parade. Although the parade doesn’t happen until summer, she leaves in the winter and enjoys a nice slow swim. When she gets there, she has fun meeting other animals and taking in the sights. A couple of years pass by, and Harriet decides it’s time to return home. 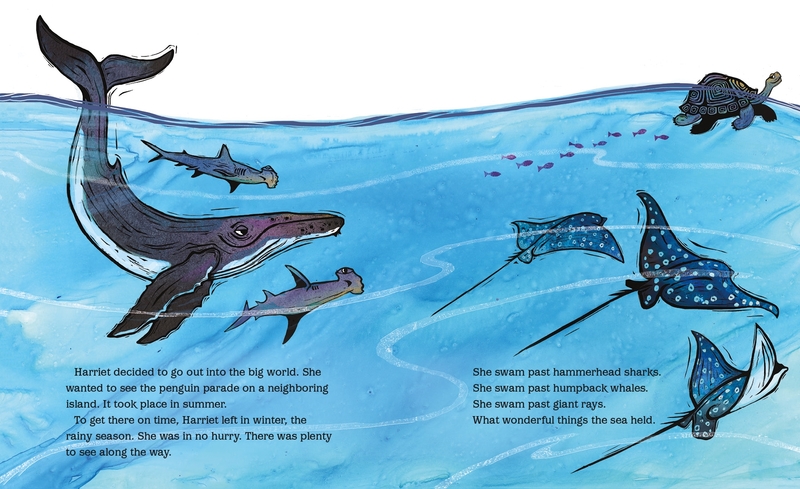 At the end of another deliberate swim, she meets a pod of dolphins, one of whom offers to give her a ride on his back. Harriet tries it out, but doesn’t like the speed. When she gets back to her island, she reflects with satisfaction on all the animals she’s met, and how each one moves to its own rhythm. An author’s note tells the story of the real Harriet, who lived to the ripe old age of 175, becoming the world’s oldest animal in captivity. 32 pages; ages 4-8. 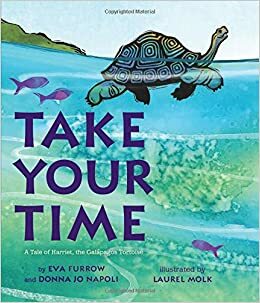 Pros: A fun and leisurely look at the life of a Galapagos tortoise, including quite a few other animals who live in that ecosystem. The prints colored with watercolors are unique and beautiful. Readers will be fascinated to learn more details of Harriet’s long life, and there’s a good lesson about finding your own rhythm. Cons: Like Harriet, the story meanders without much of a plot. Conor finally bounced a bunch more and finally fell asleep on dad’s lap at about 6:30. He had fun. Thanks for coming!